The purpose of this article isn’t to sell you some miraculous method that would supposedly bring you to fluency in two weeks. Let’s be realistic: even the fastest way to learn a language still requires a lot of work. Learning to speak a foreign language is an immensely demanding task. Two weeks of practice with a language learning app or a textbook should be enough to pick up the basics, but the time needed to master the language is usually measured in years. Of course, a lot will depend on how you define “fluency”, but that doesn’t change the fact that certain approaches tend to work faster than others. Before we dive into the specifics, it’s important to emphasize that the progress you make is directly proportional to the number of hours you put into genuine, active learning. So if your priority is to learn as fast as possible and minimize the number of calendar days that separate you from speaking the language with ease, you’ll want to maximize the time you spend practicing it each day. This is why moving to a country where the language is spoken is often viewed as the ultimate language learning strategy—it forces you to spend a significant amount of time immersed in the language. However, if you don’t really care about the absolute amount of time that will elapse before you meet your goal, you should focus on developing an effective long-term learning strategy. This way, you’ll be able to steadily improve your language skills without taking too many precious hours out of your day. No matter whether you’re racing to fluency or taking it slow, the fastest way to learn a language is to make sure that every minute you devote to learning the language is spent productively. Here are a bunch of actionable ideas that will help you optimize your learning strategy for maximum efficiency. Duolingo won’t get you to an advanced level, but it’s a nice start. Its simple translation-based exercises and hover tips will help you ease yourself into basic vocabulary and grammar structures. If you really like Duolingo, you can complete the entire course. However, try not to see it as an all-in-one language learning solution that will satisfy all your needs. The further you go down the Duolingo tree, the less you’ll benefit from each subsequent lesson. This is why it’s important to mix Duolingo with other types of practice, as well as know when to quit and move on to more advanced activities. If you put it off for later, you’ll develop bad habits that will make developing good pronunciation much harder than it has to be. YouTube is full of videos of native speakers explaining how to produce distinctive sounds—watch them until you learn to recognize and pronounce each of them. And if you manage to find a comprehensive overview of the language’s phonology, make sure to take a good look at it. This might sound like a lot of work, but it really isn’t that hard. A couple of hours spent intensively studying pronunciation can make a huge difference. Sure, you’re not going to nail the pronunciation of each and every sound as a beginner, but you’ll still see a major improvement. To practice pronouncing individual words, search for them on Forvo and compare your own pronunciation against that of top-voted native speakers. Wiktionary is also a reliable source, though its audio database might be incomplete for some languages. If you’re looking for an app to gamify part of your daily practice, Clozemaster is your best bet. It lets you learn new vocabulary and perfect your grammar by filling in the blanks (clozes) in sentences added by native speakers. Because of the way Clozemaster’s exercises are structured, you can test yourself in dozens of true-to-life sentences in mere minutes. I recommend taking Clozemaster’s Fluency Fast Track, which will teach you the most useful material based on frequency lists. And if you’d like to work on specific competencies, be sure to check out the Cloze-Listening, Cloze-Reading, and Grammar Challenge features (available for a number of languages, with more coming soon). A good learning routine keeps you on your toes and makes you stretch your skills each time you sit down to practice. At the same time, regular intervals between sessions give your brain time to rest and process what you’ve learned. One option is to follow a daily routine: just set aside some time every day and give the practice your full attention. You can do a single activity or divide your time between several things, you can follow a fixed plan or make up your mind as you go, you can do it all in one sitting or spread the practice throughout the day. The details aren’t really that important. Start by experimenting and choose whatever suits you best. Another route you might take is to develop a weekly “learning schedule”. For example, you might read Spanish books on Mondays and Thursdays, practice writing in Spanish on Wednesdays, watch Spanish movies on Friday nights, listen to Spanish podcasts when cleaning the house on Saturdays, and sit down to study with a grammar textbook on Sundays. And if you have to get through a boring commute every weekday, why not spend this time reviewing your flashcards or practicing with an app? Whichever you choose, remember that consistency is key. Do your best to stick to your schedule—the hours spent learning will quickly add up and translate into noticeable improvements. Maintaining motivation should always be a priority—after all, it’s the one thing that keeps your learning efforts going. If you lose it, your progress will grind to a halt, and everything else you’ve done to optimize your learning will cease to matter. The key to the motivation puzzle is having a clear goal that you can identify with. That shouldn’t really be a problem if you’re a person who gets excited by the very prospect of getting fluent in a foreign language. But if you’re not that lucky, look for a source of extrinsic motivation and remind yourself of it each time you lose your spirit. Imagine all the new things you will be able to do if you follow through and improve your language skills. Studying or working overseas, consuming foreign cultural products in their original language, chatting with native speakers while traveling across their country—I’m sure you can find at least a couple of reasons that resonate with you. Another way to boost motivation is customizing your practice to make it more engaging and satisfying for you. Think about the learning activities you enjoy the most—is there any way you could do them more often? And if it’s hard for you to get excited about some part of your learning routine, are there any elements you could add to make this activity more fun? Apps like Duolingo and Clozemaster get learners hooked by taking advantage of the principles of gamification. There’s no reason why you couldn’t do the same when planning your own learning. Challenge yourself to rack up a certain number of hours of practice in a single week, track the time spent learning in a spreadsheet, or simply mark practice sessions on your calendar (the “Don’t Break the Chain” method). A few simple additions to your routine might be enough to make you look forward to the next practice session. Last but not least, consider joining a community of language learners to tap into a critical driver of motivation: social bonds. There is plenty of options to choose from, among others forums, Facebook groups, Reddit (r/languagelearning and language-specific subreddits), social networks for language learners and local polyglot communities. As a member of a group of people who share similar goals, you will be able to exchange experiences, enjoy healthy competition, and get support and advice when you hit a wall. If you’re aiming for the fastest way to learn a language, forget about perfection. Though perfectionism isn’t strictly a flaw, it has stopped many ambitious learners in their tracks. Even a minor setback can look like an insurmountable obstacle for people whose definition of success is getting everything right on the first try. If you’re terrified of the very prospect of failure, you’ll be unwilling to try out new things and take risks which might lead to powerful learning experiences. Embracing mistakes is one of the keys to faster learning. Stop seeing them as proof of your incompetence, and start seeing them as a valuable source of information. Of course a certain amount of persistence will be necessary to overcome the many challenges of mastering a foreign language, but you don’t want to get stuck on a specific problem too long or cling to a single strategy well past its point of usefulness. If your aim is to learn a language the fastest way possible and to make the most of your time spent learning, you have to know when to quit and move on to more productive efforts. You don’t have to complete each course you take, finish every book you start or master every flashcard deck you start studying. Everything you do has a point of diminishing returns. So if you have a hunch that the thing you’re currently doing might not be the most effective way to reach the next level of proficiency, it’s probably a good idea to pause and consider a change of strategy. Finally, don’t be afraid of sounding stupid. I know it’s not easy to suppress the fear of making a fool of yourself in front of others. However, if you can at least realize how irrational this anxiety is, you’ll stand a much better chance of getting over it. Nobody will think less of you if you get a few things wrong, and your effort and determination will certainly be appreciated by native speakers and other learners alike. Spaced repetition is a learning technique in which practice sessions are spaced out at intervals that are optimal for retention. Thanks to spaced repetition algorithms, flashcard apps and other types of language learning software put previously learned items in front of your eyes at the best possible moment, which helps you form strong long-term memories. How can you take advantage of spaced repetition to learn faster? Imagine you want to make sure that one year from now, you will still remember all the vocabulary items you’ve learned today. One way to go about this would be to space out the review sessions equally across 365 days. So if you choose to review them weekly, you’ll have to go through 52 review sessions. If you review them every two weeks, you’ll need 26 sessions. Or, knowing that the more times you review an item, the longer you can store it in memory, you could use intervals adjusted to combat the forgetting curve. It might go something like this: 1 day, 3 days, 5 days, 8 days, 12 days, 16 days, 30 days, 60 days, 90 days, 150 days. This way, you only need 10 review sessions, but the end result is likely to be very similar. Ideally, you’ll want to take advantage of spaced repetition whenever possible to help you learn as fast as possible and make sure that you’re not wasting time reviewing something that is already firmly anchored in your memory. I highly recommend that you use a free flashcard app like Anki (available on PC and mobile) to store, learn and revise all kinds of information that can be converted into flashcards. New words, useful phrases, declension patterns, grammar rules and exceptions—all these can be memorized with the help of flashcards. You just need to get a little creative. With Anki, you can enrich your flashcards with images or convert them into cloze deletion exercises. The additional context and variety will help you learn vocabulary and grammar more effectively, so be sure to give these features a try once you are familiar with the app’s basic functionality. Of course, creating your custom flashcard decks in Anki isn’t the only way to enjoy the benefits of spaced repetition. Popular language learning apps like Duolingo, Clozemaster and Memrise all employ spaced repetition algorithms to optimize your review sessions. Note that even if you’re already using an app like this, you still stand to gain from building your very own flashcard deck. If you want to learn as fast as possible, having absolute control over what you memorize and review is just too good to pass up on. In 1935, the American linguist George Kingsley Zipf conducted one of the first studies of word frequency. Having analyzed a corpus of over 1 million words, he found that 50% of words were repeated instances of just 135 vocabulary items. 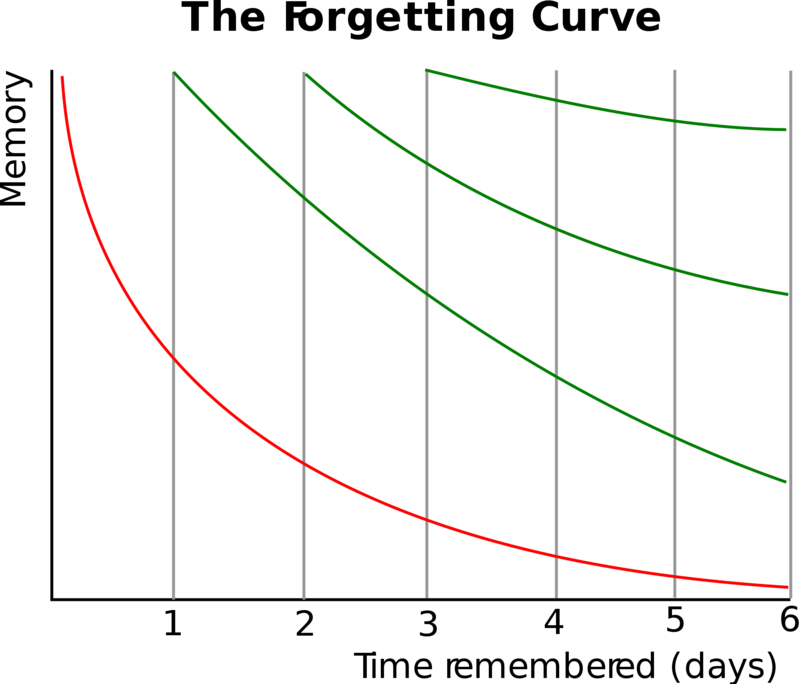 This finding led to the formulation of an empirical law known as the Zipf’s law. In a nutshell, the law says that the most commonly used word in a language is used about twice as often as the second most common word, three times as often as the third most common word, and so on. Zipf’s law has major implications for language learners looking to make the best use of their time. To get disproportionately large returns on your time investment, you should prioritize learning (and mastering) the vocabulary that tends to appear in the top part of frequency lists. Following a frequency list and learning the 2,000 most useful and common words will get you much closer to fluency than learning just any 2,000 words in that language. As you move towards less common, more specialized words, you’ll certainly experience diminishing returns. But of course, that doesn’t mean that you should skip learning them altogether—just leave them for later. Surprisingly, very few major language learning apps utilize the potential of frequency lists. In most online courses, vocabulary is introduced based on topic, and not frequency. This is why you can find yourself learning the words for “penguin” and “mayonnaise” before being introduced to words for “money” or “bathroom”. If you’re looking for a ready-made solution that will teach you the most commonly used words first, Clozemaster is one of the few apps that get this right. The entire structure of a Clozemaster course is organized around frequency lists, so you won’t learn the 1234th most common word before you’ve mastered the 1233 words that rank higher in frequency. It even lets you start in the middle: if you’re an intermediate learner and feel that you already know the 1000 most common words in the language, you can skip them and start with more advanced vocabulary. Of course, frequency lists can also be used in self-guided learning. If you’re a beginner, google for “200 most common words in [language]”, skim the list for words that you don’t recognize, and make it a priority to learn them before learning anything else. You can do the same at a more advanced stage—scanning a list of 2000 most frequent words might take some time, but it will certainly pay off in the long run. Many learners seem to think that immersion in a language is synonymous with a long stay in a foreign country. 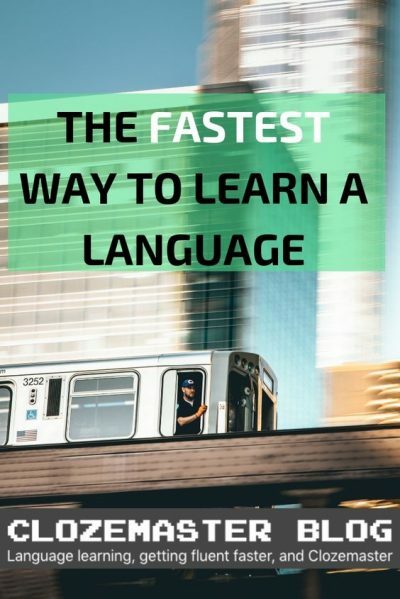 And while it’s one of the most effective ways of quickly acquiring the language (it forces you to use it on a daily basis), it’s definitely not the only one. With some self-determination and a smart approach, you can create an immersive environment for yourself without leaving the comfort of your home. First, find some things in your daily life that you could start doing in your target language. For example, consider changing the language in which you write down your personal notes. A particularly powerful way to learn new vocabulary is making your shopping lists in that language—if you buy something on a regular basis, it’s likely that knowing the word for that thing will eventually come in handy. Of course, you’ll need to consult a dictionary at first, so compiling the list might take you a bit longer than usual. It’ll get easier after a few times, as you’ll find yourself instinctively associating the words with specific items. Next, try setting your apps, games, social media sites, and even your operating system to display in the foreign language. This requires minimal effort and forces you to interact with the language on a daily basis. If changing the language makes you feel lost, give yourself some time to get used to it. Finally, if you follow the world news, look for sources that would let you get your news in the target language: set a foreign news portal as your browser startup page or simply follow a few news sources on Facebook or Twitter. You can also do the same for industry or hobby-related news that you’re interested in. The fastest way to learn a language is to read, write and think in the language as often as possible—you’ll considerably increase the number of hours you spend interacting with the language each week. It goes without saying that proper grammar is one of the key competencies you’ll need to acquire to speak a foreign language well. It’s also one of the most complex layers of the language—wrapping your head around things like word order, tenses, articles, pronouns or cases takes an enormous amount of practice. No wonder that at some point, many ambitious learners decide to grab a textbook and try to tidy up their messy understanding of the grammar. This is actually a really smart approach. Some aspects of the grammar will begin to make much more sense once you see them presented as a logical rule with a clearly finite number of exceptions. However, if you really care about efficiency and are looking for the fastest way to learn a language, reading grammar books will rarely be the best way to advance your language skills. Without exposure to meaningful context and real-world practice, much of the studied material will simply slip through the cracks. This is why you’ll be better off keeping a grammar book on hand and only studying individual chapters whenever you notice that a particular topic is giving you a hard time. This way, you’ll avoid wasting time on things that you would naturally acquire by interacting with well-formed language. I’m sure you’ve heard about false friends: words that look or sound deceptively similar to words in another language, yet mean something completely different. You might have stumbled upon lists of false friends while browsing some resources, or perhaps your language teachers warned you against the most treacherous ones. I would argue that just as you should look out for false friends, you should seek out and learn “true friends”: cognates, borrowings and grammatical structures that are similar to ones occurring in your own language. Identifying cognates (words that are very similar to corresponding words in your own language) is probably the closest thing to taking a shortcut when learning foreign vocabulary. Seeing the Spanish verb posponer for the first time is likely to automatically evoke associations with the word to postpone—so if you give it just a little extra effort, you’ll quickly memorize a pretty useful word. Similarly, associating the German word sterben or the Dutch word sterven (“to die”) with the verb to starve will make it much easier to remember its meaning, even if it’s a bit more general than that of the English word. But what if the language you’re learning belongs to a completely different family and doesn’t have much in common with your mother tongue? While you’re unlikely to find similarities between verbs like in the examples above, you can still do some research into borrowings from English. For example, Russian and Japanese both have plenty of loanwords which sound almost identical as in English, such as свитер (sviter—“sweater”) and チケット (chiketto–“ticket”). Moreover, due to the role classical languages have played in the shaping of the vocabulary used of science, technology, and art, a great deal of specialized vocabulary in various world languages originates from ancient Greek and Latin. Because of this, you will find it extremely easy to guess the meaning of the Italian word educación, the Polish word medycyna or the Hungarian word demokrácia. Instead of dismissing such words as obvious, see them as low-hanging fruit and memorize them early on. Apart from exploring connections to other languages, another way to significantly improve your ability to remember foreign vocabulary is through analyzing its structure. In other words, you should spend some time learning what the common building blocks of words are and how they affect the meaning. Then, whenever you see a new word, you can pause for a second and see if you can recognize any familiar bits. These will usually be various prefixes and suffixes that can be used to negate a verb, make an adjective out of a noun, modify the meaning of an adjective, and so on. For example, you might find it useful to know that while the Dutch prefix ver- doesn’t have a clear-cut meaning in itself, it usually denotes a state of becoming or a change in condition, as in the verbs verbeteren (ver- + beteren; “to improve”) and verdrijven (ver- + drijven; “to expel”). Internalizing this kind of things will improve your comprehension, allowing you to work out the meaning of many words without looking them up in the dictionary. Moreover, you should find it easier to “encode” new words in your memory, which will effectively speed up the rate at which you learn new vocabulary. If you’d like to take your listening skill to the next level, it’s important that you realize that there are essentially two ways you can practice listening, each with its advantages and limitations. In active listening, you give the spoken content your full attention. And since your mind isn’t occupied with anything else, you can make the extra effort required to catch and comprehend things that you would otherwise miss. When listening passively, you focus on something else and treat the audio as a background to whatever you’re doing. While you could argue that the words still go through your subconscious, you won’t be able to fully process them unless you deliberately focus on the recording. Most learners spend more time listening passively than actively, which is hardly a surprise in today’s busy world. Playing a podcast or an audiobook on headphones while commuting or doing chores takes minimal effort, and makes us feel like we’re saving time and making extra progress. I don’t want to completely discourage you from passive learning—if you have to knock out a few chores and would like your brain to do a little bit of learning in the meantime, go ahead and put on some foreign language audio. However, you should keep in mind that in terms of the fastest way to learn a language and benefit per minute, active listening will always beat passive listening. The difference is significant—if I had to decide between 10 minutes of active listening and 30 minutes of passive listening, I’d always choose the former. So how do you set up your active listening practice? First of all, remove all potential distractions, so that you can give the audio your undivided attention. If you’re not an advanced learner, I recommend that you start by listening for the gist or reading a transcript (if available). Knowing the context will help you focus on the details the next time you listen to the recording. Give the audio another listen or two. Look for words, phrases or entire sentences that you can understand, and try to work out the bigger picture from there. Note that if the recording hasn’t been adapted for learners, you will probably fail to make out most of what is being said. Don’t get discouraged—remind yourself that even if you’re confused right now, listening to natural native speech early on will definitely pay off in the long run. To take the practice even further, look for other ways to engage with the spoken content. Challenge yourself to transcribe the recording as accurately as possible—pause it every few moments and write down everything you’ve managed to make out, leaving gaps for the parts that you’ve missed. Once you’re done with that, you can start using the audio for passive listening. The takeaway is pretty straightforward. To improve your listening skills faster, maximize the amount of time you spend listening actively, and save passive listening for when you’re unable to give the content your full attention. Conversing with native speakers is one of the most engaging ways to quickly improve your language skills. Unfortunately, many learners wait too long before they start using the language in actual conversations. Some of them seem to think that they are not ready to speak the language, and somehow expect that they will prepare for the challenge by doing everything but speaking. Others wait for the perfect opportunity, believing that the only way to improve their speaking skills is to spend months or years in a foreign country. The sooner you’ll start speaking, the more time and frustration you’ll save yourself in the future. Considering how easy it has become to connect with people from around the globe, there’s really no reason to put it off. There are multiple places on the Internet where you can find people willing to exchange languages or just chat with you. If you want to find a speaking partner as fast as possible, you should definitely check out language learning communities. Some of the most popular ones are HelloTalk, Speaky, Interpals, and Meetup (for in-person meetings). People who join them mostly do so with the intention of exchanging languages or helping people who are trying to learn their native language. You might also want to search for Facebook groups or forums connecting learners with native speakers. These are usually full of helpful people who might agree to chat with you or give you some recommendations. Another option is services like Speechling and iTalki where you can get feedback and speak with professional language teachers. If possible, arrange a voice-chat conversation with your speaking partner—while texting is definitely a viable option, it doesn’t force you to think on your feet like speaking does. When you feel stuck, try to resist the temptation to switch back to English. Learning how to ask for clarification and explain things you don’t know the words for is a critical skill that you should practice as often as possible. If necessary, do some research online and find some phrases that you could use to get out of trouble. This minor investment of time should pay off really quickly—no matter how hard you study, you can’t expect to prepare yourself for each and every topic. To make the best out of the time spent speaking with others, be ready to take notes during your conversation. Jot down every single piece of feedback you receive and try to notice phrases and grammatical structures that tend to stop you in your tracks. This should give you a pretty good idea of what areas you should focus on in your practice to help you learn faster. Finally, a crucially important thing to remember is that you have no reason to feel embarrassed about the mistakes you’ll inevitably make when speaking. The great thing about arranged speaking practice is that nobody is going to judge you or make fun of you. Try to keep this in mind whenever you feel ashamed or overwhelmed. Intensive reading is a learning technique adopted by many ambitious language learners. The process is really simple: dig into a foreign language text and read it carefully several times until you feel like you couldn’t understand it any better. To get to that level of understanding, you’ll need to go through the entire thing several times, taking your time to look up the meanings of unfamiliar words and unravel some of the more complex grammatical structures. Since you want to maintain focus throughout the entire exercise, it is advised that you choose texts that are somehow relevant to you. The length doesn’t matter much—simply stop when you’ve had enough, whether you’re reading an entire book or several short articles. You’ll pick up where you left off during your next intensive reading session. The reason why this method is so effective is that it makes you stop and focus your attention on individual sentences, phrases and words, each time questioning their exact function, meaning and relation to other parts of the text. While this type of practice is usually associated with reading, you can apply the same basic principles to any competency. To practice listening intensively, play a recording several times, each time giving it your full attention. You might think you’ll never be able to figure out some of the more challenging bits, but repetition combined with deep concentration can do wonders. To make it easier for you to pick out individual words, regularly pause the recording or use the variable speed setting in your player to listen to it at a lower speed. Intensive writing practice can be arranged in a number of ways. One simple technique that can be used by learners at almost any level is rewriting. Your task is to take an existing text and write your own version, expressing all the main points in different words. How far you veer from the original text is up to you. Beginners can start with replacing words and phrases with synonyms and slightly modifying the structure. If you’re an advanced learner, you can focus on summarizing the content from memory or telling the same story from your own point of view. The purpose of this exercise is to take the fundamental components of correct language from the original text and make them your own. All the above intensive learning methods can be seen as examples of deliberate practice—the type of practice that, if undertaken regularly, will take you all the way to mastery. They all take advantage of the fact that the harder you have to work to process a new concept, the more ingrained it becomes in your brain. Keeping this in mind, you can design your own techniques that will help you learn faster by leveraging intensity and attention. Whatever you do, you should always be working towards an intuitive grasp of the language by copying and internalizing good models. According to research, you’ll more likely to remember new material if you test yourself on what you’ve just studied, rather than by studying the same material over and over again. This is why, if you’re aiming for the fastest way to learn a language, you should make it a habit to quiz your understanding of the topics you’re learning as often as possible. You don’t even have to wait until you finish studying the topic—tests done in the middle of practice have been proven to enhance retention of new material. Your test doesn’t have to be anything fancy. It can be as simple as conjugating a verb out loud or writing down three meaningful sentences with the grammatical structure you’ve just learned. However, keep in mind that simple isn’t necessarily the same as easy. Actually, the harder you have to work to get to the solution, the more you’ll get out of the practice. Of course, the entire premise of tools like spaced repetition software and language learning apps revolves around testing—you’re tested each time you review a flashcard, fill in a cloze or translate a sentence. This is what makes them so effective: using an app like Clozemaster, you can subject yourself to dozens of tiny tests in mere minutes. Few learning techniques can top that. Another thing you’ll need to keep improving your language skills (or any skill for that matter) at an optimal rate is immediate feedback. Delayed feedback will hardly do anything for you—by the time you receive it, the thing that it could help you improve will no longer be on top of your mind. To weed out errors and reinforce correct assumptions, you’ll want to be able to reflect on the feedback as soon as possible. Once again, many language learning apps are specifically designed to help you get the most out of immediate feedback. It’s easy to notice how the feedback principle ties into the idea of testing. When you test yourself on the learned material, the feedback you receive is instantaneous and precise. You notice what you’ve already mastered and what still needs some work. In fact, the very attempt to retrieve an item from your memory is the first step towards improvement, as it strengthens the relevant connections in the brain. In educational psychology, this phenomenon is known as the testing effect. So how can you maximize the amount of valuable feedback you receive? When studying something that probably has a definite answer, research it thoroughly and make sure that the answer you’ve provided is indeed correct. If not, try to figure out what went wrong and how you can avoid similar mistakes in the future. Perhaps you should add some tricky word to your flashcard system or devote extra time to practicing a specific grammatical construction. On the other hand, when dealing with more open-ended problems, you should seek feedback from people who can look at them from a much wider perspective—preferably native speakers, teachers or more advanced learners. Ask them to find issues in your writing or point out errors in your pronunciation. Make it clear that what you’re looking for is honest—perhaps even a bit harsh—feedback, not reassurance that you’re doing perfectly fine. There’s a common thread running through most of these principles and techniques: if you want to learn a language as fast as possible, rather than simply resolving to learn more, you should seek ways to optimize your practice and ramp up its intensity. And how do you go about this? First, you have to ensure that you have enough motivation to follow through and learn in ways that are often cognitively demanding. Once you’ve taken care of that, you should work on your focus: the harder you’re able to concentrate on your practice, the more information you can absorb every minute. Finally, if you’re already feeling motivated and focused, the best thing you can do to learn faster is to make sure you’re using your time effectively. Try to be more aware of the choices you make in your everyday learning: are you practicing this way because you know it’s what works best for you or are you just taking what seems to be the easiest way? Do not be afraid to experiment every once in a while. You can start by trying out a few of the ideas gathered in this article. Clozemaster is a no-nonsense language learning app that has been optimized for efficiency, making it an ideal choice for learners looking for interactive practice that will accelerate their progress. Clozemaster’s exercises are based on a deceptively simple premise. Your task is to fill in gaps in sentences sourced from an online database. Since the sentences come from native speakers of the language, they reflect how it is actually spoken and offer more realistic context. If you’ve ever felt like language learning apps are just a waste of time, Clozemaster’s mass-exposure based approach will make you change your mind. Get started practicing one of the dozens of available languages on Clozemaster! Thank you for your great post. I myself agree that you can’t get fluency on a language in a few weeks and i think that you have to WORK if you wanna learn a new language. I have just began to try learning spanish and will see in a few months where it will take me. Hi Tyyppi, glad you enjoyed the post! You’re right, learning to speak a language well without putting in the time and effort is just plain impossible. Learners who forget about that tend to lose motivation as soon as they notice that reality doesn’t match their expectations. Good luck with learning Spanish! Adopting that kind of attitude from the very start should make it much easier for you to overcome potential obstacles, and that’s already something. Great article. Same as TYYPI mentioned. Also started Spanish a few weeks and I am very excited to see where I go in a few months. Working full time so I have to carefully plan my schedule but I still manage to put in at least 90 minutes a day. I’m still not at the speaking stage but I will force myself to start speaking to a native next month. Your plan sounds great, developing a steady routine and sticking to a schedule is really important, especially if you don’t have that much free time to begin with. I admire your determination—seems like you understand very well that learning a foreign language is not always a walk in the park, and that sometimes you just have to force yourself to do the right thing (such as starting speaking early on).